Due to the recent news coverage about Volkswagen having modified its car software to pass pollution tests, we decided to share (for the first time) a Top 10 extract from our global automotive apps watchfolder. Our objective is to provide a complementary analysis on what are the most successful Volkswagen apps worldwide. BUT if you check the type columns, those apps are… RACING GAMES! Which in term of content strategy, reveals that Volkswagen is (was?) more focus on its brand image by providing fun and free racing games (that people LIKE) rather than editing apps that people do actually NEED! 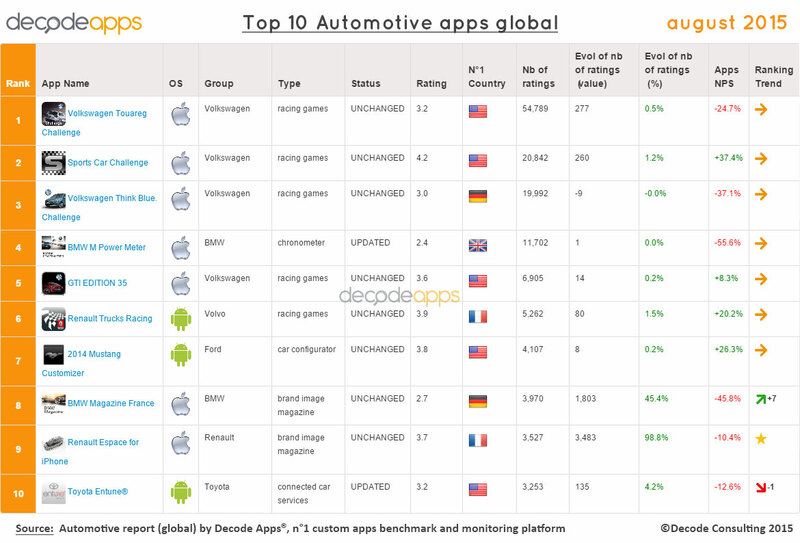 As games are fun but not quite useful for car buyers, we analyzed with our decode apps platform what were the fastest growing apps in the Volkswagen apps portfolio. So our “macro” advice to the VW group would be to concentrate their mobile apps budget to improve customer services AND/OR connected cars support apps (or eventually eco-drive games;), rather that on brand image games! Want to start fueling your mobile apps strategy with the #1 custom apps benchmark & monitoring platform in the market?